This was our first full day in Munich and we decided to do what any half decent Australian would do and go to Oktoberfest site itself. Firstly, we had agreed to meet up with Julia and Tobi for breakfast at a really nice cafe. We spent a really pleasant couple of hours sitting, eating and generally just enjoying the beautiful Autumn morning. They also brought along Lily’s sister, Carlotta who is just adorable as Lily. I know that it’s hard to imagine to those who know Lily, but its true! She was walking around to other tables saying “Wie heist du?” (“What is your name?”) before walking off leaving the occupants of the table either laughing or just staring at her confused. This is keeping in mind she is 2 years old. So cute. 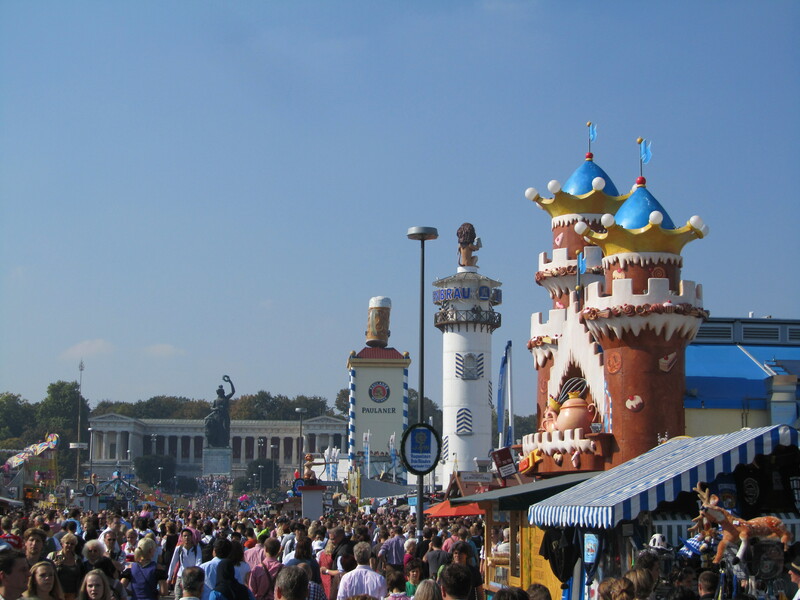 When left the cafe at around 12:30 and headed to the S-Bahn (train) which took us to the Oktoberfest site. When we arrived, it was packed. I mean millions of people. You would constantly share you 1m square with anywhere between 2 and 5 other people. It was such a nice day and being the Sunday before the whole thing was over, people wanted to enjoy it before it finished the following day when the people outside of Munich would have to head home. (It would normally have finished on the Sunday but the last day this year was the Monday as it was a public holiday for there Unification day.) We walked around the sight for maybe 30 minutes and didn’t even make it all the way to the other side, just soaking up the atmosphere. At some point we walked past the same beer hall that Tim, Joel and I had been to just 3 years before and from inside we could hear the party getting going in there well and truly. The thing that caught my attention the most was you could hear people inside chanting the ‘Seven Nation Army’ riff which was one of the strongest memories from last time I was here. We all agreed we had to go in. So we walked up to a door where there were a couple of people waiting to get in and we lined up behind them. After a few minutes, they were let through and we got to the front. Now I really don’t feel like going into the details but after 50 minutes of waiting at that entrance in the baking heat while the bouncer just didn’t let us in really kind of ruined the day. We eventually just walked away.